The fixtures that make up this Chrome Finish Clawfoot Tub Shower Kit are all manufactured by Kingston Brass. Although the finishes in the images may vary a little, in actuality these items are EXACTLY 100% the same color. With this Clawfoot Tub Shower Curtain Rod Enclosure Kit and a Kingston Brass Clawfoot Tub Faucet purchased from Faucetlist.com you will have a perfectly compatible design. 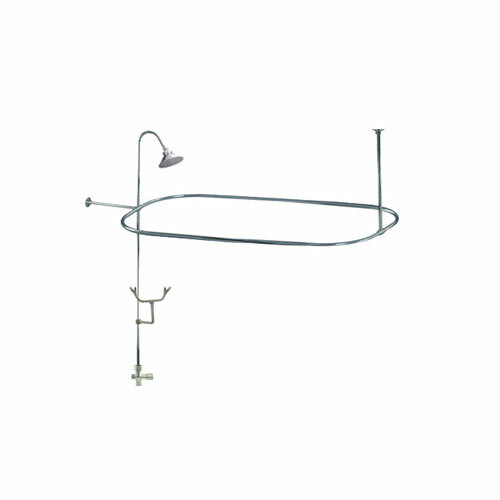 The vintage style of the Clawfoot Tub Shower Kit will match all of our Clawfoot Bathtub Fixtures perfectly. Since this item requires the Clawfoot Faucet body to have a Diverter lever, you must have a clawfoot tub faucet with hand shower. We recommend you use this shower conversion kit with a Kingston Brass Clawfoot Tub Faucet with Hand Shower. Browse our many great Chrome Finish Clawfoot Tub Faucets and choose the perfect style. Chrome Clawfoot Tub Shower Conversion Kit with Enclosure Curtain Rod: This Chrome Clawfoot Tub Shower Conversion Kit is built to last. The highest quality standards are used to precision manufacturer a top of the line Clawfoot Tub Shower Curtain Rod Enclosure Kit. Important features of this 100% BRAND NEW Fixture: Complete Item! Everything necessary for installation is included. PACKAGE INCLUDES - Solid Brass Shower Head - Clawfoot Tub Shower Curtain Rod and Shower Riser - Clawfoot Tub Shower Pole Mount Hand Spray Cradle - Clawfoot Tub Shower Faucet Diverter - Constructed in high quality brass - Beautiful premier finish - Chrome premier finish designed to resist fading and tarnishing. For the clawfoot tub designed for a lifetime of exceptional performance. This fixture is manufactured by Kingston Brass and is part of their Vintage Heritage collection.